Binding energies of exciton and charged exciton confined in a strained CdTe/CdMgTe cylindrical quantum dot are investigated as a function of dot radius with various height of cylindrical dot. Numerical calculations are performed using variational procedure within the single band effective mass approximation. The interband optical transition of CdTe/CdMgTe quantum dot is calculated with the various structural parameters. The valence-band anisotropy is included in our theoretical model by using different hole masses in different spatial directions. The exciton oscillator strength and the exciton lifetime for radiative recombination as a function of dot radius have been computed. Our results show that quantum size has a considerable influence on exciton states and interband optical transitions of the narrow dots. 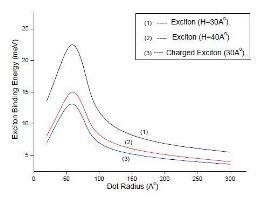 It is observed that (i) the ground state exciton binding energy and the interband emission energy are increased when the cylindrical quantum dot height or radius is decreased, (ii) charged exciton is tightly bound having higher recombination life time compared to bare exciton and (iii) the exciton radiative lifetime strongly depends on the dot radius and reaches tens of picoseconds. Our results are in good agreement with the recently published results.